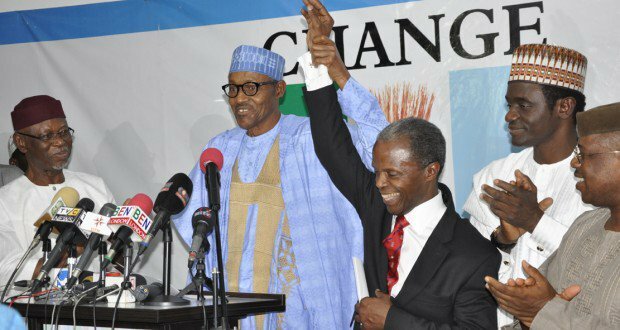 2019 Election: No automatic ticket for Buhari – APC – Royal Times of Nigeria. The All Progressives Congress (APC) has said it would abide by its rules in the choice of the 2019 presidential candidate – downplaying giving an automatic ticket to President Muhammadu Buhari. Governor Mohammed Abubakar of Bauchi disclosed this yesterday, in Abuja shortly after an expanded meeting of the National Working Committee (NWC) of the party, its state governors and principal officers of the National Assembly. When asked whether the ticket was open to anyone or restricted to the President only, Abubakar, who was flanked by the Senate Leader, Ahmed Lawan, and the party’s spokesman, Bolaji Abdullahi, said the issue of endorsing the President or otherwise did not come up for discussion. He said the meeting did not also discuss the reported stance of some South-West leaders of the party to the effect that the ticket was open to anyone. He stated, “This meeting has not deliberated on that but the APC has a constitution and that is one of the items that was discussed; the amendment of the constitution of the APC in order to faithfully hold the constitution of the APC in line with democratic principles, and we will abide by the provisions of our constitution,”.